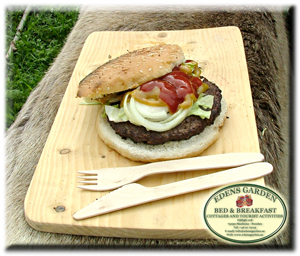 Edens Garden strives to serve you locally produced- and organic food. So we create an unforgettable taste experience for our guests-, we encourage local producers and we maintain the focus on nature and environment. We supply a bag filled with products for a healthy breakfast. 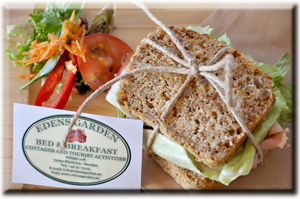 The breakfast is always generous and if the weather is good, you can join your the breakfast in our garden. 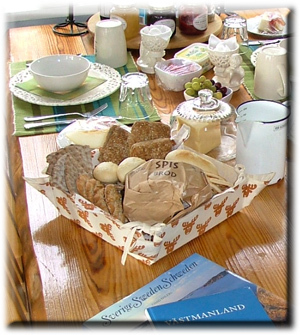 Depending on the weather, you can do a BBQ at the grill on our yard or at the canoe jetty with he river “Svartån”. All cozy decorated with reindeer skins, oil lamps and original details. from 375, – SEK p/p. for grilling in the garden or at the jetty.